On the 35th anniversary of two warm up shows at Vorst Nationaal in Brussels on 18/19 of May, 1983, Denis O'Regan has given us an exclusive glimpse of what might have been, with a shot from his upcoming Ricochet: David Bowie 1983 - Photographs by Denis O'Regan from the Serious Moonlight tour. 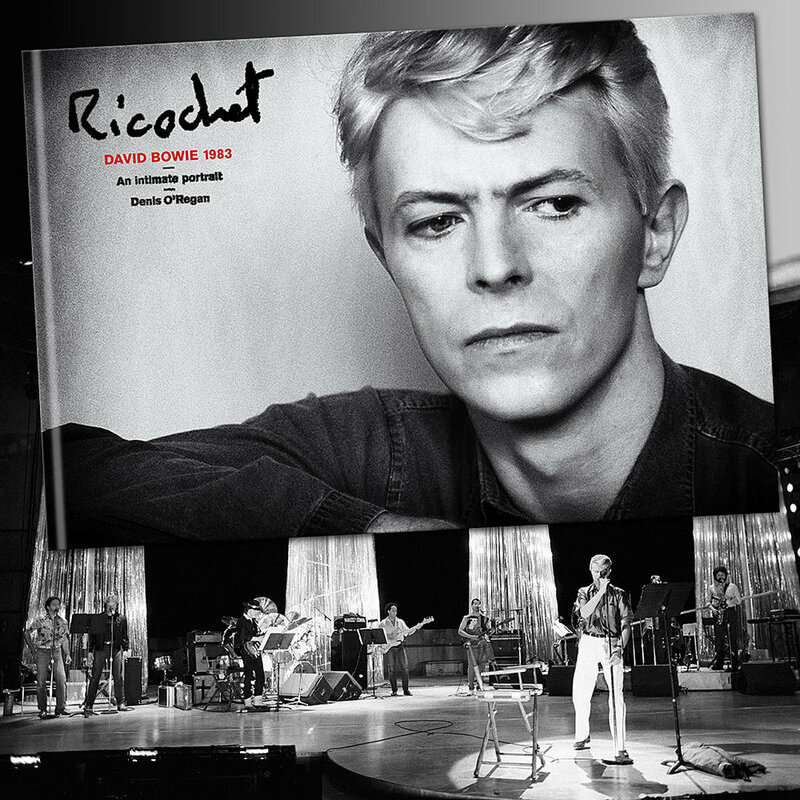 Aside from the cover for the hardback fan version of Ricochet illustrated here*, David Bowie is pictured in rehearsal in April at Las Colinas in Dallas in the US, with a band that still featured guitarist Stevie Ray Vaughan (SRV). As you know, Earl Slick was the last minute replacement for SRV, but that’s a whole other story. You have to give the man some credit. Rather than cynically tout a freeze-dried legend around the world - Rolling Stones stylee - Bowie has created a show that lives up rather than down to expectations. Not on the basis of his legend or his publicity, but on the strength of this show, Bowie is the finest white pop performer alive. I’ll be very surprised to see any of Bowie’s alleged peers produce anything remotely this good for quite some time to come. And who are we to say that CSM was on the money with that conclusion? But, CSM was on the money with that conclusion. Stay tuned for more exciting exclusives from Denis shortly. Also, check out www.Itsahugeboxedset.com to learn more about #bowie1983book. *The hardback fan version of #bowie1983book (a medium format version of the main coffee table book from the limited edition boxed set) is now available for pre-order on Amazon. Published Nov 1st by Particular Books.